In case you didn’t already know, most people in the U.S. are wheat dependent. That is, they’re addicted to eating all things wheat and wouldn’t know what to do without it. You know what I mean. Bleached or unbleached it makes cakes, cookies, fried chicken, bread, etc… Consequently, governments of the world’s “developing” nations are ca$hing in big as they distribute wheat, one of their most profitable commodities, largely, to the U.S. Without that income from U.S. wheat consumers, those countries’ leaders wouldn’t know how else they’d bring in so much money- besides drugs, arms, diamonds, oil and prostitution rings. Anyway, in addition to all the above, wheat really isn’t the greatest grain for melanin dominant people whose indigenous lands offer numerous other grains. For melanin dominant individuals, especially, excessive wheat consumption is a major contributing factor of CONSTIPATION, ECZEMA, DIABETES and HAIR LOSS. Want HEALTHY HAIR and SKIN? Try a few of these ancient grains. They’ve been around a long time, without causing any trouble. Oats contain more SOLUBLE FIBER, B VITAMINS, LINOLEIC ACID and VITAMIN E than other grains and, they’re GLUTEN~FREE! Oats can help to LOWER BLOOD CHOLESTEROL levels and act as NERVE SEDATIVES, which is why we feel so relaxed after a nice warm bowl of oats. Oats slow the absorption of carbohydrates into the bloodstream, maintaining blood sugar levels, helpful for DIABETICS. Oats also have mild detoxifying properties in that they draw impurities, cleansing blood and SKIN. Try making an OAT FACIAL. Binding properties in oats strengthen muscles and aid in bone growth, making this an excellent food source for young children. s…YUMMY! Also, I Love OATMILK. et used as a grain. Looking for GLUTEN-FREE and Great for CHILDREN? Try quinoa. uinoa casseroles (baked w/veggies) and quinoa burgers. i Brown is MY FAV!!! in B VITAMINS, POTASSIUM and MAGNESIUM. Rice helps to stabilize BLOOD SUGAR levels and is an excellent source of FIBER for maintaining BOWEL HEALTH. ling class was obsessed with whiteness, the common folk were healthier. Proof, once again, that everything white ain’t always right! *MY FAV…is NOT millet..LOL. I do like it but, only as a cereal. Rye is a rich source of MAGNESIUM, which significantly lowers the risk of DIABETES by controlling blood sugar level. Also an excellent source of FIBER, which promotes weight loss. u before: When you think of magnesium, think of MELANIN. Let’s talk about Teff: Timeless, Tiny, Ethiopian, Gluten-Free. Known as the smallest grain in the world, it consists of the BRAN and GRAIN of the plant (the most nutritious parts of any grain). 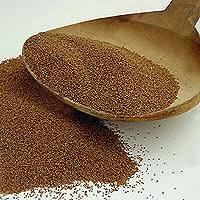 Teff is high in CALCIUM, PHOSPHORUS, IRON, AMINO ACIDS, PROTEIN, FIBER and COPPER. In Ethiopia it’s used to make their national unleavened bread, injera and fermented and brewed into a delicious beverage. *MY FAV way to use teff..Making a cereal with agave and cinammon, pancakes and, of course, injera!! !